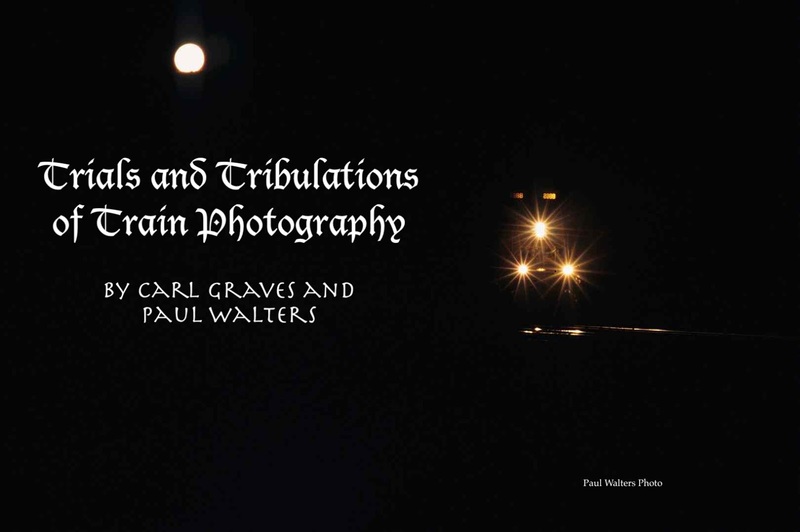 For more than 30 years, Carl Graves and I roamed the central and western United States, searching for the perfect railroad photograph. The article that follows was put together by Carl, with some small assistance from me, in the hope that we could find a spot for it in a railfan publication. When this was originally written, many years ago, there were several potential publication sources. Most of those have gone out of business, and this piece has yet to be published. Still, Carl persists in his efforts to find a home for it, and I admire his persistence. While in pursuit of the elusive perfect railroad photo, have you ever found yourself in unfortunate circumstances that make you wonder why any sane individual would have such a hobby? We have driven through monsoons and forest fires, up mountains and down canyons. Our cars have gotten stuck, our camera equipment lost, and our plans destroyed, yet we soldier on. To illustrate some of these predicaments, we present photos that we took, or tried to take, before misfortune struck. We follow the sun because, like photoelectric cells, our mood and energy are inversely proportional to the percentage of cloud cover. We have changed our destination by hundreds of miles based upon sky conditions at dawn. Thus, when planning separate or joint expeditions, we look for clear horizons. Mother Nature, however, often intervenes in strange ways. During Carl’s August, 1989 trip to Bear Mountain, New York, rain came down so relentlessly that he took shots from the open door of his companion’s van. During most of our visit to Montana in June, 1994, the cloud cover over Bozeman and Mullan Passes was as dark as the closed lid of a pot. Both of us had thought Montana would be a better location than New York, because it rarely rains in Montana. 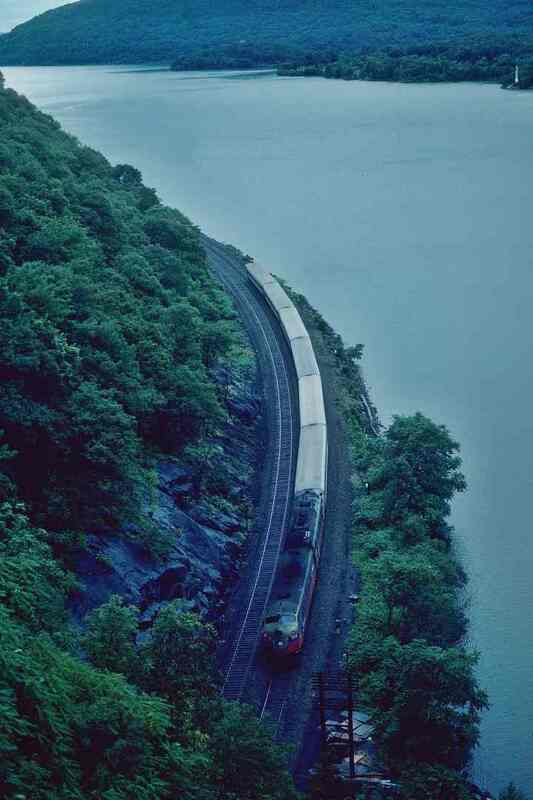 Rain and clouds followed Carl as he tried to photograph trains like this Metro-North northbound at Anthony's Nose along the Hudson River at Bear Mountain, NY, in August, 1989. 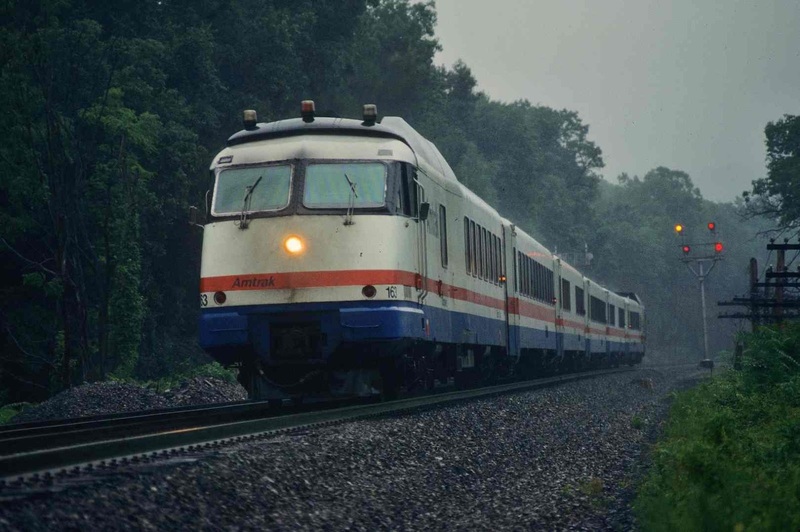 Amtrak train on the Hudson River line arrives at Cold Spring, NY during a downpour that forced Carl to take his pictures from the inside of his companion’s van, August, 1989. 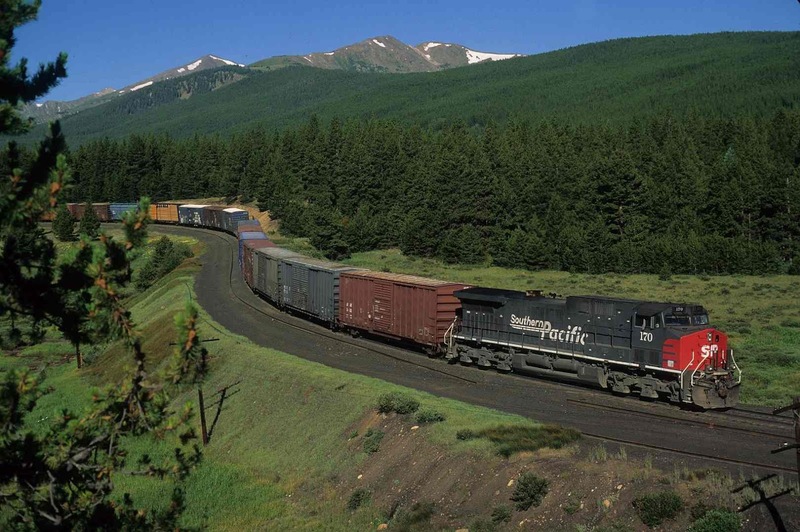 Montana Rail Link manned midtrains help pull a westbound coal load, the NN185, at Austin, MT on Mullan Pass. The clouds have already blotted out the sun on 6-12-94. 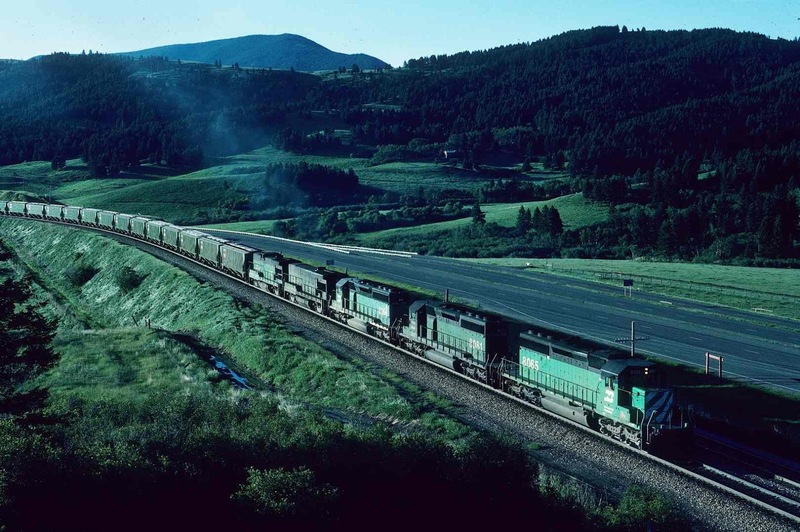 A westbound BN grain load, train G15, struggles up the east side of Bozeman Pass, MT on 6-9-94 during one of the infrequent times when the sun was out. The next summer we decided to try a hotter, dryer climate, so we spent several days at Abo Canyon, New Mexico, shaking our fists at dark clouds. One afternoon we saw a tiny hole in the gloom and madly drove west to a bridge over the Rio Puerco. Here we took a shot, then put our vehicle in reverse to change locations, whereupon our five-gallon water jug tipped over and drenched the interior of the van. We tried Tehachapi in the summer of 1999 because we were confident that it never rained in Southern California that time of year. Not only did it rain, but the wind was so strong that it almost blew our rental car into a ditch. The next day’s headline shouted: “Record Precipitation! Mudslides!” We have seriously considered hiring ourselves out as rainmakers. 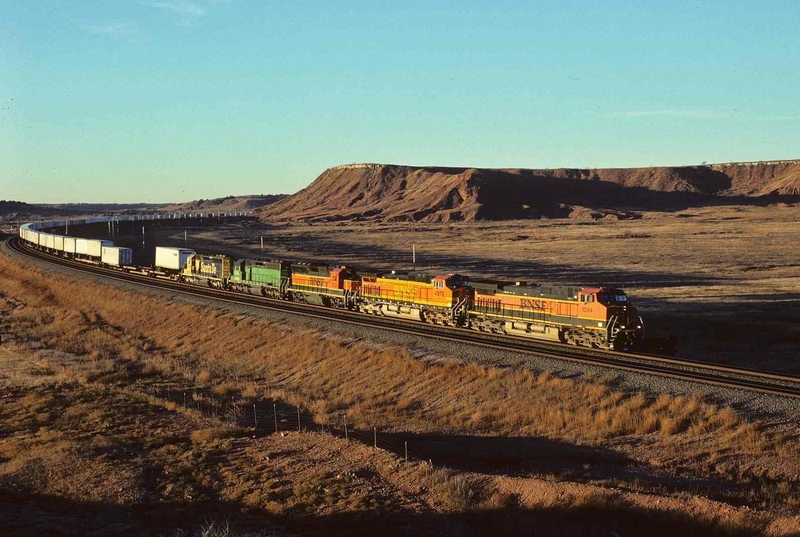 A westbound ATSF pig train passes an eastbound auto train at Sais, NM, on the west side of Abo Canyon, July, 1995. This evening was one of the few times that sun briefly appeared. Paul Walters shot. 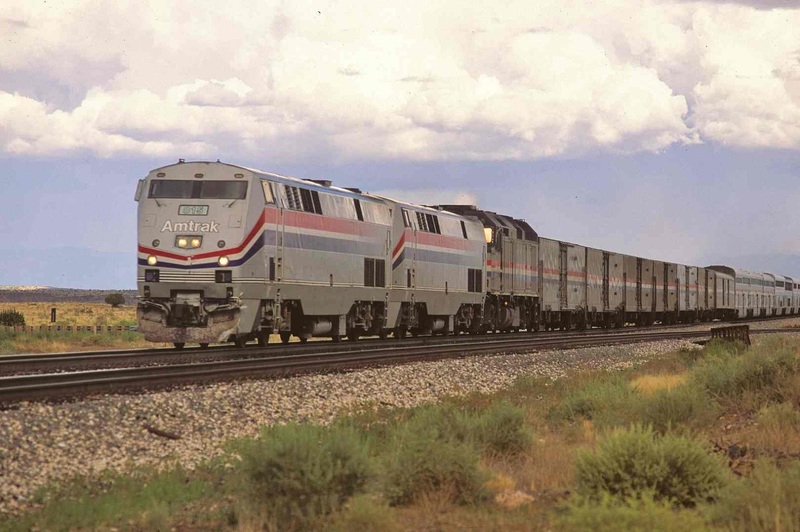 Westbound Amtrak #3, the Southwest Chief, races through Rio Puerco, NM, under increasingly cloudy skies in July, 1995. At this location, our five-gallon water jug capsized, drenching the interior of Paul’s van. Eastbound BNSF manifest M-BAKBAR rounds the curve at Caliente, CA, 7-15-99 during a brief sunny period before the clouds rolled in to disrupt our trip to Tehachapi. Winter precipitation has seldom been a problem for Carl’s front wheel drive Toyota, which can handle up to six inches of the white powder. He therefore headed for his favorite rural overpass on the BNSF Emporia Sub near Ottawa, Kansas, following a four-inch snowfall several days earlier. Little did he know that wind had blown the powder into drifts, making the unplowed section roads treacherous. His car crunched to a halt, having bottomed out on a drift that had hardened due to previous thawing and freezing. For fifteen futile minutes, he attempted to dislodge the packed powder and ice with his snow shovel, all the while hearing whistles from numerous fast freights just a quarter mile away. While on his knees, he heard a noise behind him, turned around and saw a Ford pickup with massive tires. Its owner, Rocky Woods, was in the area to check his cousin’s nearby dairy farm. With the aid of a heavy chain, Rocky used his jumbo four-wheel drive truck to ferry Carl’s little Toyota out of the snow. Cheerfully refusing Carl’s offers to pay him, Mr. Woods drove off to feed the cows while Carl returned to the main highway into Ottawa. In town Carl discovered a plowed alternate route to the overpass, but by the time he reached the spot, the line had gone dead. The lure of photos like this of the WB V-MCPX on the BNSF Emporia Sub at Ottawa, KS, 12-1-96, tempted Carl out on a nearby country road, where he got stuck in snow and ice. Local farmer Rocky Woods rescued him. 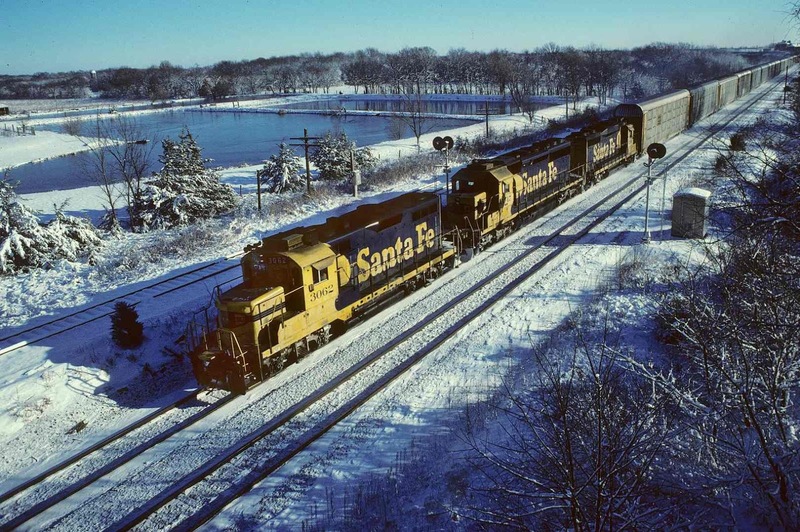 The lure of photos like this of Santa Fe warbonnets leading the EB S-RICH on the BNSF Emporia Sub at Ottawa, KS, 12-1-96, tempted Carl out on a nearby country road, where he got stuck in snow and ice. Local farmer Rocky Woods rescued him. Winter has one more weapon—ice—that can even stop four-wheel drive vehicles. 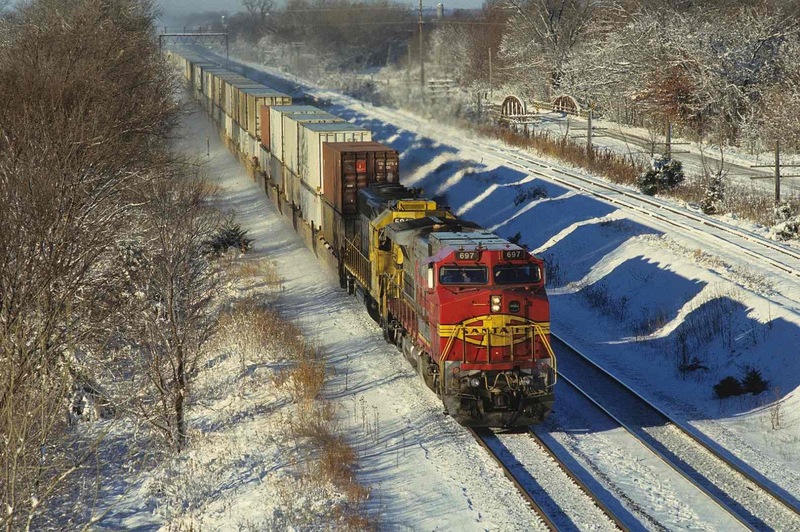 A few days after a Christmas visit to his in-laws in the Twin Cities, Carl persuaded his wife that they should drive back to Kansas by way of La Crosse, Wisconsin, since the nearby BN and Soo Lines along the Mississippi River would look beautiful in the snow. The morning after their arrival, however, freezing drizzle caused his photo plans to fizzle. The unhappy couple spent the next 24 hours in town. The highlight of the stay was crawling on hands and knees across the ice from the motel to the adjacent restaurant. 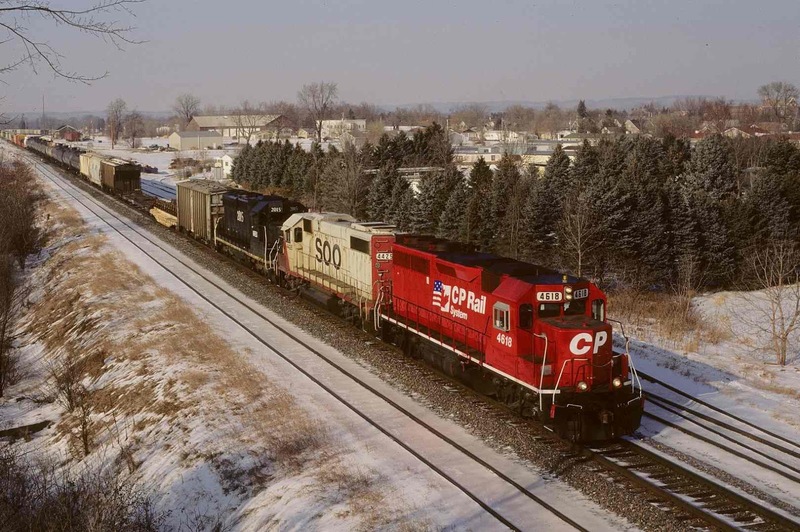 Vision of photos like this one of CP train 223 eastbound at Wabasha, MN, 12-28-95, inspired Carl to suggest to his wife that they return home via La Crosse, WI, which was hit by an ice storm. 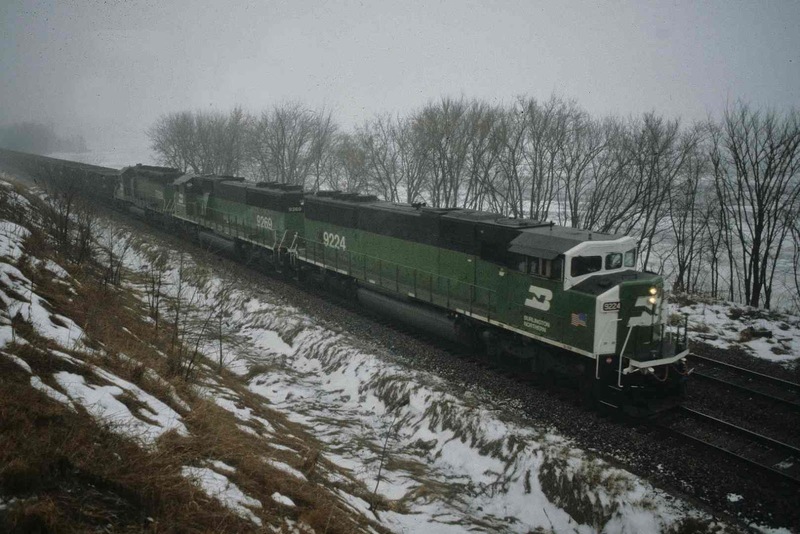 This empty westbound BN taconite train south of La Crosse, WI, was the only shot Carl took before retreating to La Crosse, WI, where he and his wife were trapped by an ice storm in late December, 1993. On an August, 1987 journey to Wyoming, we encountered fog so thick that the birds were literally walking on the rails. We also traveled "washboard" roads that nearly shook out our teeth. Some of the worst were at Sherman Hill, an impressive but desolate location. Driving back to the motel one evening from Hermosa Tunnel, we felt our Cadillac Cimarron (which went out of production years ago) jerk and chug violently like a sick cow. We noticed that the “check engine” light had come on, so we dutifully checked the engine. It was still there. Not knowing what else to do, we drove to a General Motors service department in nearby Laramie, where a technician blandly told us that the problem could be something serious or something benign. "Hard to tell," he said. Not wishing to be stranded in desolation, we abandoned Sherman Hill and began heading back to Oklahoma, nearly 900 miles away. After a depressing night at a Denver Motel 6, we noticed the next morning that the chugging was gone, so we quickly headed for nearby Moffat Tunnel on the Rio Grande. The shaking returned by the time we reached Big Ten Loop, however, so we turned around and chugged our way back to the Sooner state. 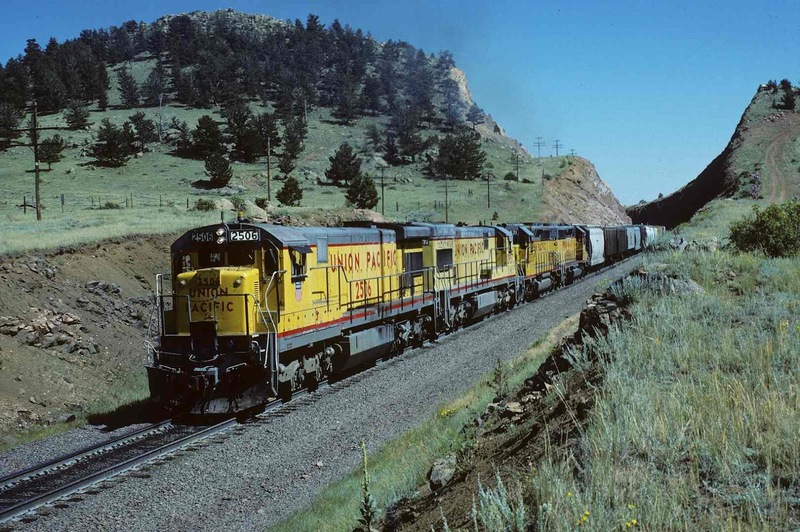 Westbound UP manifest on track #1 at Sherman Hill, WY, was one of the few bright spots for Paul and Carl in August, 1987, because Paul’s Cadillac Cimarron later developed engine trouble that sent them home. 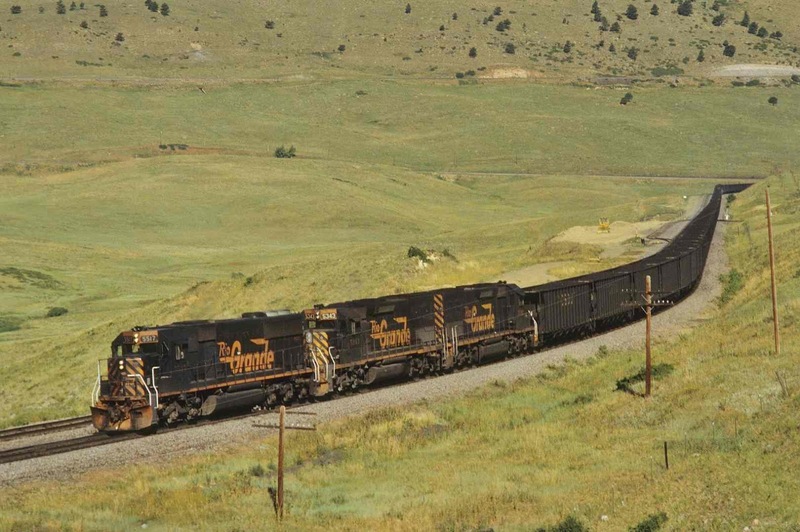 This eastbound loaded Rio Grande coal train leaving Big Ten Loop just west of Denver, July, 1989, was the type of picture Paul and Carl hoped to get in August, 1987. After appearing to be well, however, Paul’s Cimarron once again started chugging, causing the guys to return to Oklahoma. In the summer of 1992, Paul drove from Oklahoma to La Crosse, Wisconsin, to rendezvous with Carl, who was traveling from Kansas. Our plan was to shoot the BN and Soo line sides of the Mississippi after our arrival. Carl was so eager to see the scenic region that he left the evening before and drove all night. Shortly after midnight on I-94 near Rochester, Minnesota, he felt the car jump as if the back right tire had run over a railroad tie. An inspection revealed no obvious damage, so he continued north. After a sunrise arrival at the big river, Carl spent a happy day shooting Soo Line trains. By late afternoon, however, his car began to shake. When he inspected the vehicle in Winona, Minnesota, he saw that the right rear tire had been knocked so far out of alignment that portions of the rubber tread were worn down to the steel belt. His heart sank as he slowly drove his wobbling car toward his rendezvous spot at Dakota, across the river from La Crosse. Although Paul’s arrival meant we had a second vehicle, the next day a local Goodyear store got a hefty amount of Carl’s money to replace both rear tires and align all four wheels. 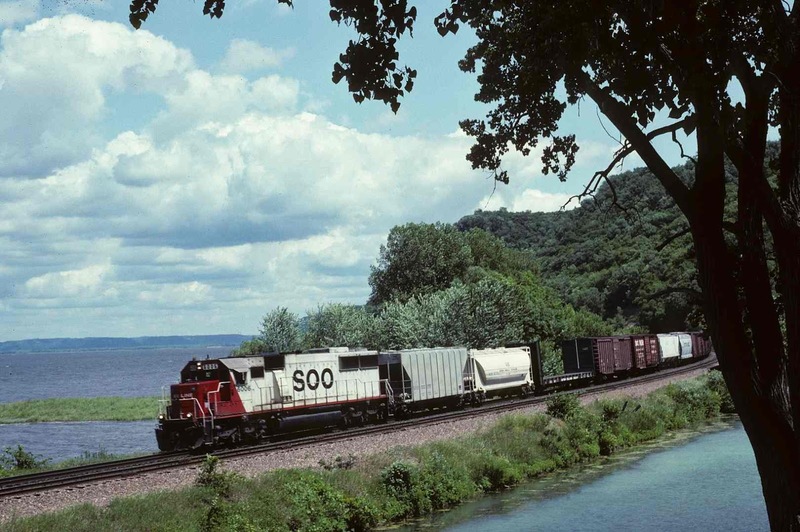 Westbound Soo train, is shown here at Maple Springs, MN, on 6-92 at a beautiful spot along the Mississippi River. Scenes like this led Carl to drive through the night to reach the spot in the summer of 1992. He damaged his car during the night. Paul Walters photo. It was fine at first, but soon we came upon gigantic ruts left by dinosaurs. Had we driven into them, we would have died before someone found us, so we attempted to drive between the ruts, but soon we came to a hole the size of a bathtub. As we bounced in and out, our heads banged against the ceiling. Cameras, lenses, and tripods went flying. We made it to the highway, but only after driving through the edge of a wheat field to avoid a sinkhole of mud the size of Rhode Island. Although we did get our shots of the z-train at the top of the grade at Belmont, we have decided that if one of us ever again attempts to navigate a “Minimum Maintenance” road, the other will shoot him. Pushers on a BNSF eastbound coal load begin shoving this train toward Crawford, NE, and Crawford Hill on 8-8-02. In 1997, Paul and Carl tried to chase an eastbound intermodal by navigating a minimum maintenance road near this location. They barely escaped the treacherous path. Paul Walters photo. 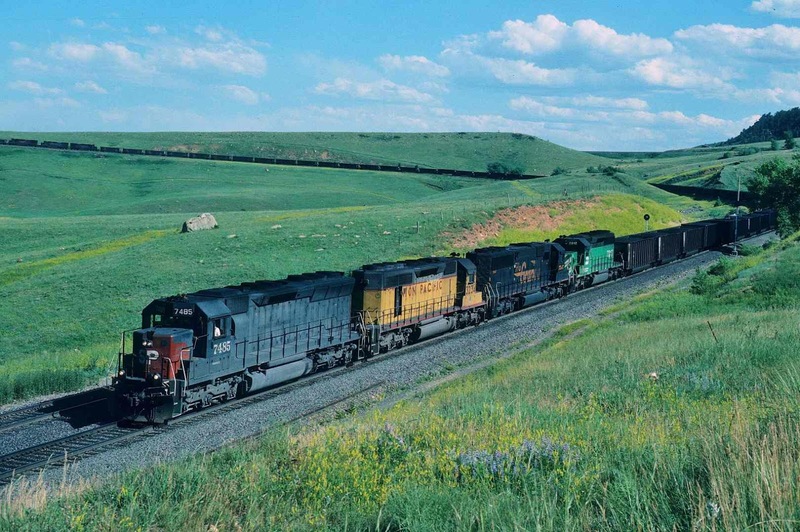 On a beautiful cloudless sunrise in late November, 2001, Paul was standing on a hill overlooking a huge cut at Curtis Hill, Oklahoma, listening to a westbound BNSF stack train in the distance struggling up the grade. Then he heard the higher-pitched sound of a GMC Suburban driving along the service road next to the tracks. The vehicle stopped and out jumped three men in Army fatigues, each carrying a rifle. One yelled at him, claiming that the sun had been glinting off Paul’s tripod and scaring away the deer. Another growled, “I paid two thousand dollars for this hunt.” Paul suddenly remembered that it was deer season, and for a moment thought it might be railfan season as well. He hadn’t realized that the hill where he stood was leased to a hunting club after Thanksgiving. They forced him into the van and drove him to the nearest town, Waynoka, where they called the Sheriff and asked to have Paul arrested. The Sheriff declined. So then they called the local game warden, who also saw no reason to prosecute Paul. This game warden eventually sent a sub-warden out to take Paul off the hunters’ hands. The sub-warden arrived, the hunters departed, and so did Paul. He no longer visits Curtis Hill during deer season. Eastbound BNSF z-train passes Heman, OK, late November, 2001. Near this spot, angry deer hunters surrounded Paul. Paul Walters photo. In June, 2002, Carl drove to the Kansas City Southern crew change point of Heavener, Oklahoma, next to the beautiful Rich Mountain grade through the lush Ouachita National Forest. 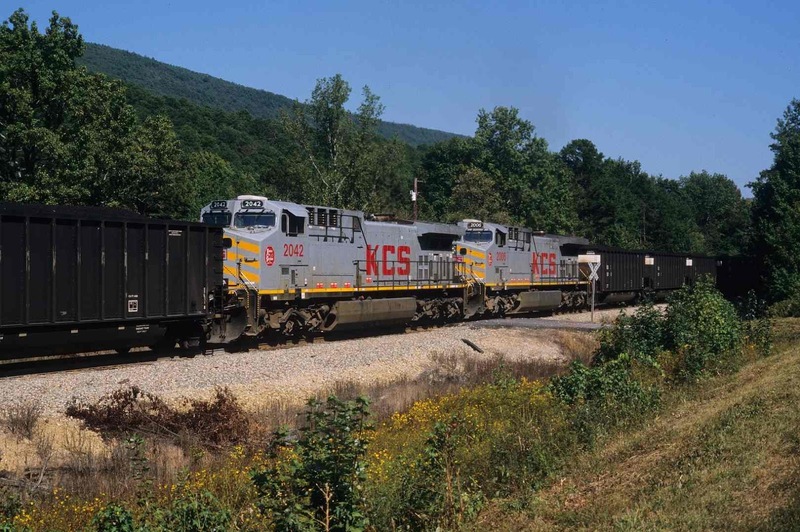 After his late afternoon arrival, he snapped several shots of KCS trains growling out of the yard. On the drive to his motel in nearby Poteau, however, he heard another type of growling—this one coming from the left front of his car—that sounded like a bad wheel bearing. Carl did not sleep much that night. Next morning’s drive to the yard caused an even louder noise, so he called the Toyota people back in Kansas. The service department advised him to head to the nearest company dealer 90 miles away in Muskogee. On the two hour-long drive, Carl’s car made as much noise as a KCS coal train climbing Rich Mountain. The Okies in Muskogee replaced his seized-up wheel bearings, but Carl, his nerves frayed, abandoned the KCS and returned to Kansas. Carl had hoped to get shots like this one of mid-train DPUs on southbound KCS coal train 97 west of Rich Mountain, AR, 9-28-02. A bad wheel bearing foiled his plan, forcing him to limp to Muskogee, OK, for repairs. Carl had to make another trip in late September to get these pictures. 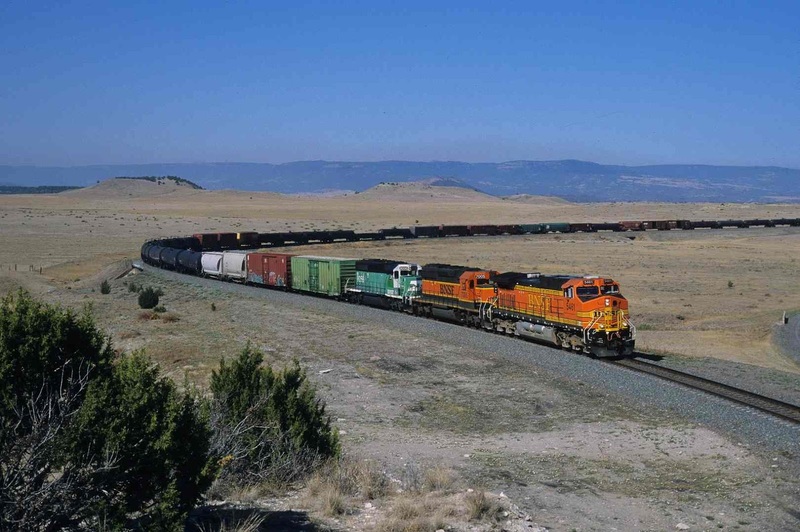 In October of 2003, we had a strange encounter along the busy BNSF Sand Hills Sub in Nebraska, which runs through wetlands frequented by swans, geese, pelicans, and especially ducks. We were driving back to Thedford after an evening meal in Alliance. 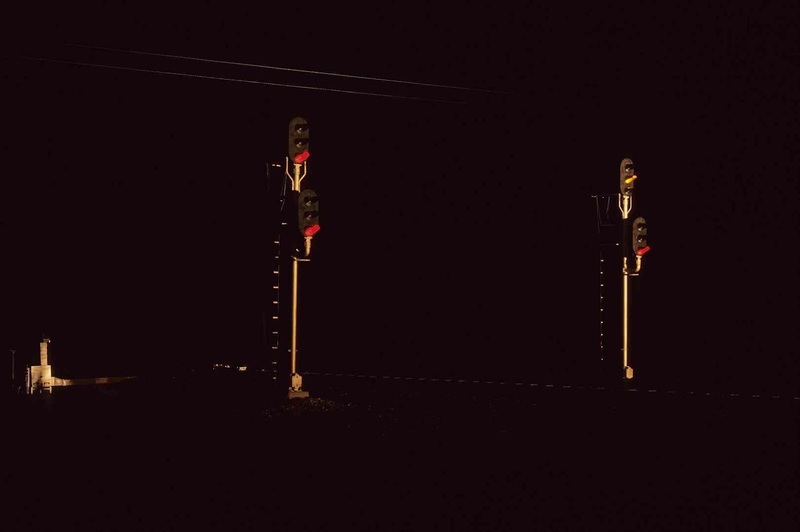 Our goal was to get some inspiring night shots of signals, train headlights, and rails. Cruising along in darkness near Ellsworth, we were started by a “Thump! Bang! Whap!” After Paul brought the car to a halt, Carl leaped out of his seat to inspect the damage. A quick glance caused Carl to burst out laughing. A duck (we think) had struck the car’s hood just above the windshield and then careened into the hood-mounted scanner antenna. The force of the bird dislodged the antenna, but since it was connected to the car by a coaxial cable, the antenna whirled downward, miraculously affixing itself to the rear door by means of its magnetic base. The metal rod was neatly pointed parallel to the ground as if designed to be mounted horizontally! After repositioning the antenna, we pulled across the road to an adjacent crossing and photographed signals as well as a westbound BNSF coal empty. We don't know what happened to the duck. 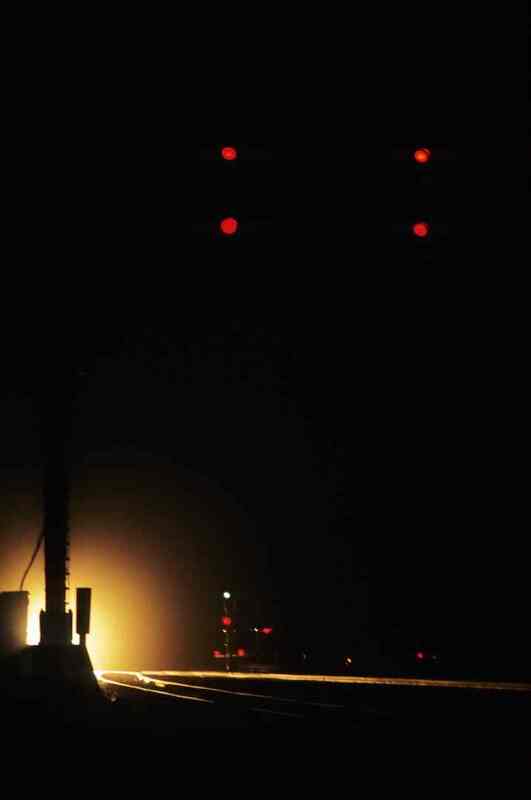 After a duck knocked their car scanner antenna onto the side door, Carl took this shot of signals lit by a westbound train in October, 2003, near Ellsworth, NE on the BNSF Sand Hills Sub. On the late afternoon of July 4, 1997, we were heading from Crawford Hill to the Budget Host Motel in Grand Island, Nebraska, whose cranky owner had warned us on the phone that he went to bed at eleven p.m. on the nose, so we had better arrive before that time or else expect to spend the night in the parking lot. The problem was that after leaving Alliance, we kept seeing one westbound after another, each looking increasingly photogenic as the summer sun sank lower in the sky. Since each halt to snap a shot put us further behind schedule, we drove faster and faster to retrieve lost time, which was easy to do on lightly-traveled Nebraska Highway 2. Paul was driving about 75 mph (the speed limit was 60) when we rounded a curve and looked straight at an oncoming Nebraska patrol car! As the officer checked Paul’s license and car registration, he eyed our railroad hats and our van full of camera equipment. Then he asked if we were taking pictures of trains. We told him yes and tried to explain railfanning in a way that did not make us sound like idiots. We believe we failed. Then the headlights of an approaching westbound appeared. After taking a deep breath, we asked him if we could take a picture of the approaching train. His eyebrow twitched, making us think he was about to handcuff us both, but he agreed to our request. We got our shots, then returned to our vehicle, where the trooper sent us on our way with a warning to slow down. Chastened, we drove the speed limit without stopping until we arrived at the Grand Island Budget Host ten minutes before the owner went to bed. Trains like this westbound BNSF coal empty near Broken Bow, NE, kept delaying Paul and Carl until Paul started speeding. A Nebraska trooper stopped them on July 4, 1997. Paul Walters photo. Carl once tried night photography by an old Santa Fe-era cantilever signal on the BNSF at East Ottawa, Kansas. After a short wait, a z-train blew by at 70 mph. Instinctively, Carl jumped back as the train-generated wind blew over his heavy tripod as if it were a toy. Still attached to the metal legs, his Nikon F3 fell with a bang on one of the rails, smashing the back. Disgusted, Carl retrieved the broken camera, slung his tripod over his shoulder, and trudged back to his car. Before Carl could drive away, he was surrounded by five flashing police cruisers, out of which leaped officers with bulletproof vests and large guns. After being handcuffed, Carl meekly explained that he was a railroad photographer with camera gear and train calendars in his car to prove it. After a fast inspection of Carl’s vehicle, the officers quickly undid the cuffs and apologized. 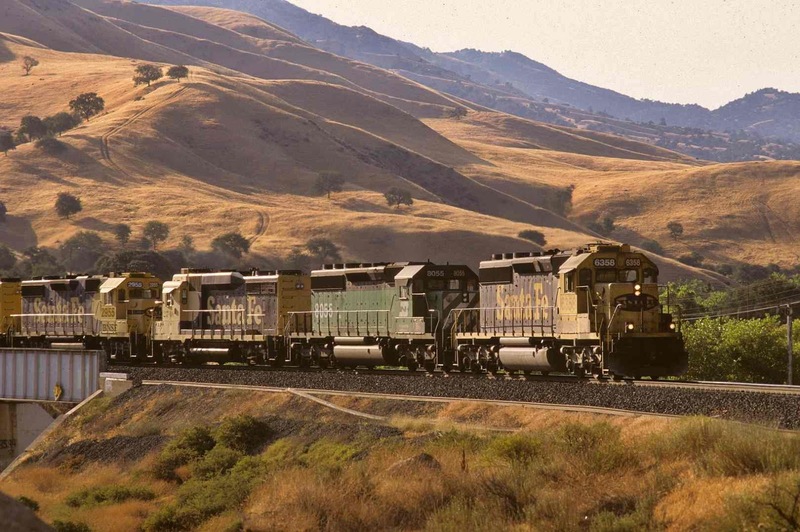 They explained that the BNSF dispatcher called them because a train crew had reported a person along the right of way. Coincidentally, the police had recently received a report of a mentally disturbed man walking the railroad tracks with a firearm, threatening to shoot himself. (Carl certainly fit the description of a mentally disturbed man, but he does not own a firearm.) The first officer on the scene, peering through the darkness, mistook Carl’s tripod for a rifle, thereby triggering the SWAT team ambush. A free man once again but breathing heavily, Carl wobbled back to his car and returned home. In April, 2003, Carl was hoping to improve upon this vertical shot, taken 4-10-99, at a Santa Fe-era cantilever signal at East Ottawa, KS, on the BNSF Emporia Sub. He got too close to the tracks, touching off a series of events leading to an encounter with Ottawa police. In the summer of 1996, after a successful day of photographing SP trains struggling over Tennessee Pass, we decided to celebrate with dinner at The Saloon in Minturn, Colorado. At the end of a perfect meal, Paul offered to pay the bill. He reached into his wallet for his American Express card but could not find it. After remembering the last place he had used it, he phoned the Leadville Amoco service station, whose owner affirmed that the card was there. We drove back across the pass to Leadville in the dark and rain, blinded by the oncoming headlights of a series of trucks that seemed determined to force us over the side of the mountain. The trip from Minturn to Leadville, which had brought us so much pleasure in daylight, was now a risk to life and limb. We arrived in Leadville, picked up the credit card, wearily turned around and again drove across the pass back to Minturn and to our motel in Eagle. Around midnight we arrived, exhausted and grumpy. SP eastbound freight with DP pushing on the rear is in the s-curve beneath snow-capped peaks at Mitchell, CO, 8-1-96, on the soon-to-be-abandoned Tennessee Pass line. After a great day photographing trains like this, Paul lost his credit card, causing an arduous night journey through rain along mountain roads from Minturn to Leadville, CO, and back. 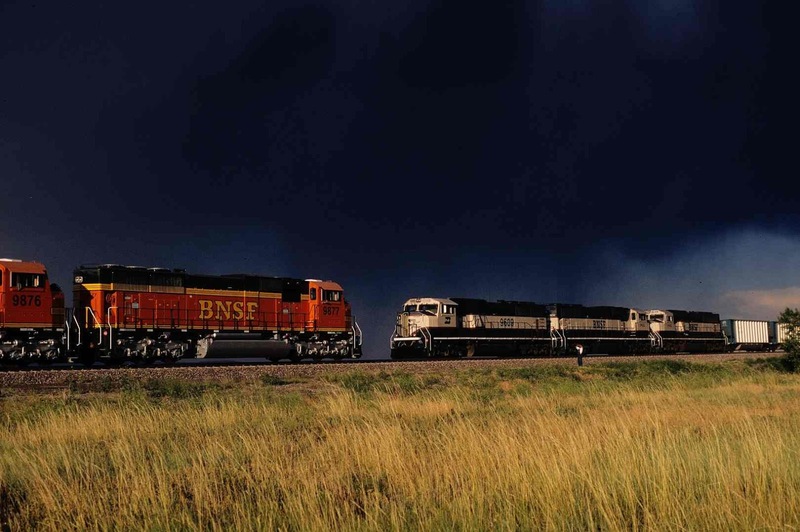 In 1998, we were dodging thunderstorms at Branson, Colorado, on the very edge of the high plains country that stretches to the very end of the earth, when we located a motionless westbound BNSF coal empty at a siding. 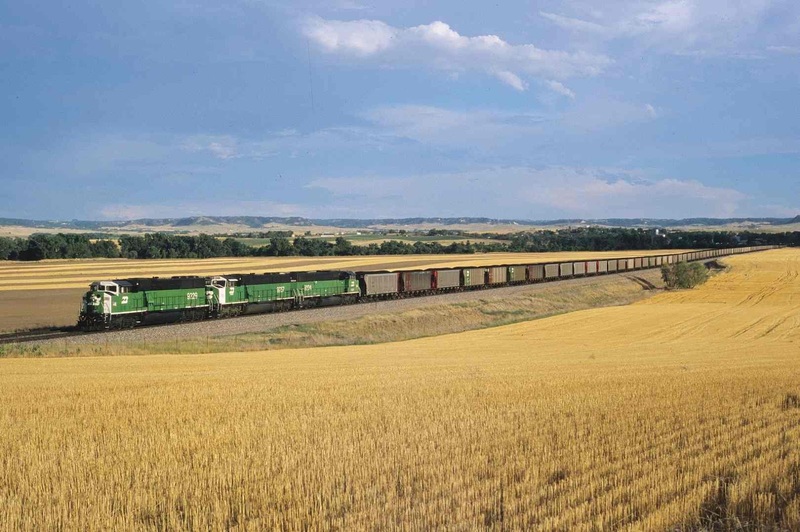 Judging by the clouds and scanner, a wait could produce a jackpot—storm light photos of that train along with an approaching eastbound coal load. Unfortunately Carl had begun to feel sick, so the longer we waited, the more listless he became. Eventually we got our photos, but when we packed up our equipment, Carl could not find his tripod. Paul remembered that Carl had put it down somewhere in the tall grass adjacent to the siding, but Carl’s wooziness made him forget the exact location. At Paul’s suggestion, we systematically walked back and forth in a grid pattern, checking the ground in the fading light. After what seemed like an hour (it was likely 20 minutes), Paul spotted the elusive tripod. Under beautiful storm light, two BNSF trains meet at Branson, CO, on 7-14-98: the eastbound C-CRMAMH at left and a westbound coal empty from OklaUnion, TX at right. Carl lost his tripod in the tall grass, causing Paul and Carl to search the grass while Carl got sicker and sicker. Once Paul lodged his vehicle deep in sand while attempting shots of the BNSF Canadian River bridge in the Texas panhandle, and during a trip to Big Canyon, Oklahoma, had his sleep disturbed by a couple making whoopee in an adjacent motel room. Carl had his car mired in tar at an I-94 rest area on the way to the Soo Line at La Crosse, Wisconsin, and lost his camera while making a hasty exit from the Amtrak depot in Lee’s Summit, Missouri. On joint trips, we have been stymied by Mississippi River fog and forced to leave Trinidad, Colorado due to forest fires. We were nearly blown off Breezy Point at Crawford Hill by the breeze and required to retreat from Big Ten Loop due to bulls. We have certainly had our share of trouble, and we suspect that many of you reading this can recount your own tales of woe. 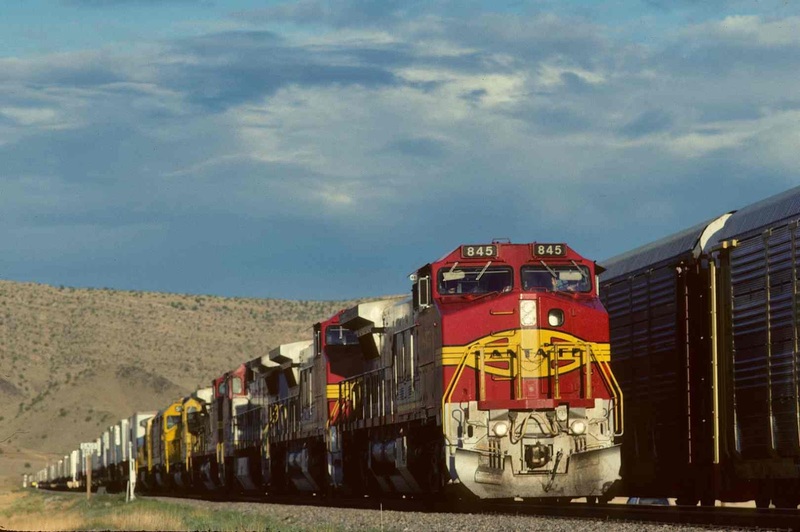 Why do we continue to pursue our railfan hobby in the face of such trials and tribulations? At times, we do not know. 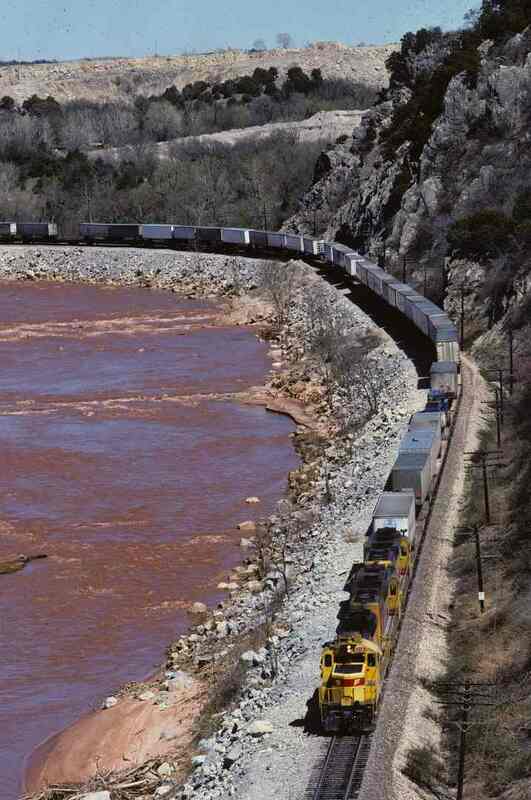 Southbound ATSF pig train along Washita River in Big Canyon, OK, February, 1988. Years later Paul returned to the canyon but spent a sleepless night at a motel in Davis, OK because of the activities of a couple in an adjoining room. Paul Walters photo. 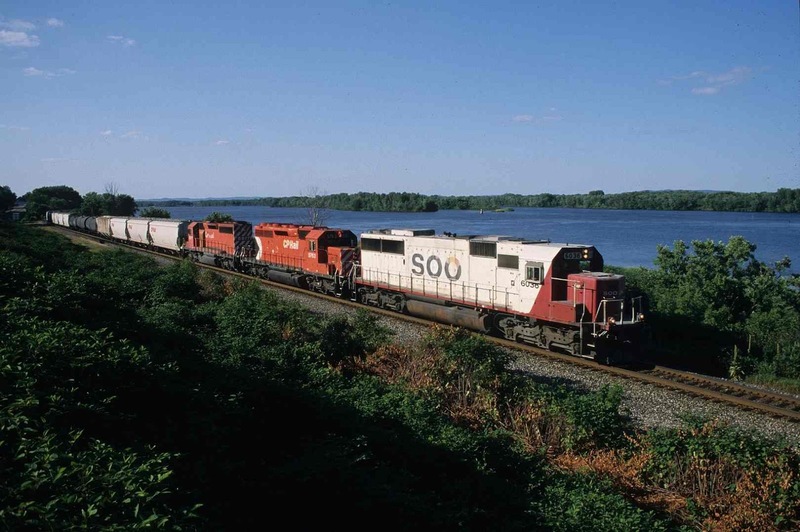 Soo-powered eastbound Canadian Pacific freight passes Dakota, Minnesota, on July 24, 2003. On the way there—driving at night—Carl got his car tires mired in tar at a parking lot under construction at an Interstate 94 rest area. 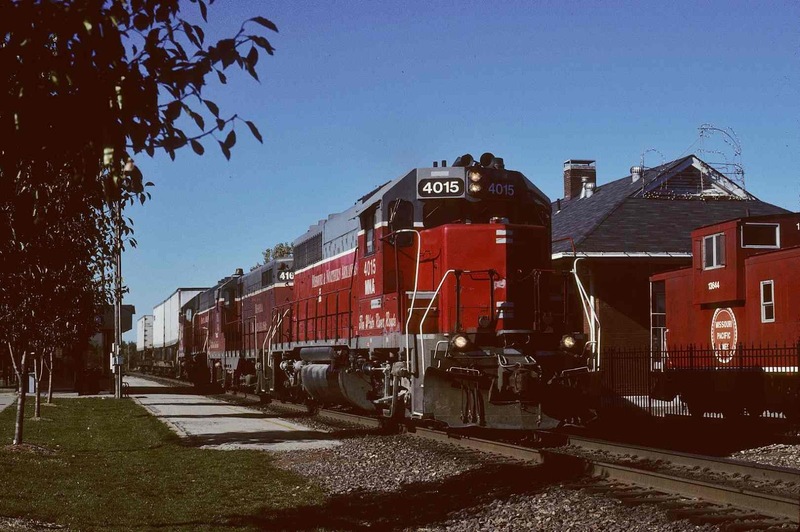 After taking this shot of a Missouri & North Arkansas local on 10-23-99, in Lee’s Summit, MO, Carl left the Amtrak depot without taking his camera with him. Forest fire smoke, just starting to rise up from nearby Raton Pass in New Mexico, would soon drive Paul and Carl out of this area along BNSF’s ex-Colorado & Southern line through Trinidad, CO. 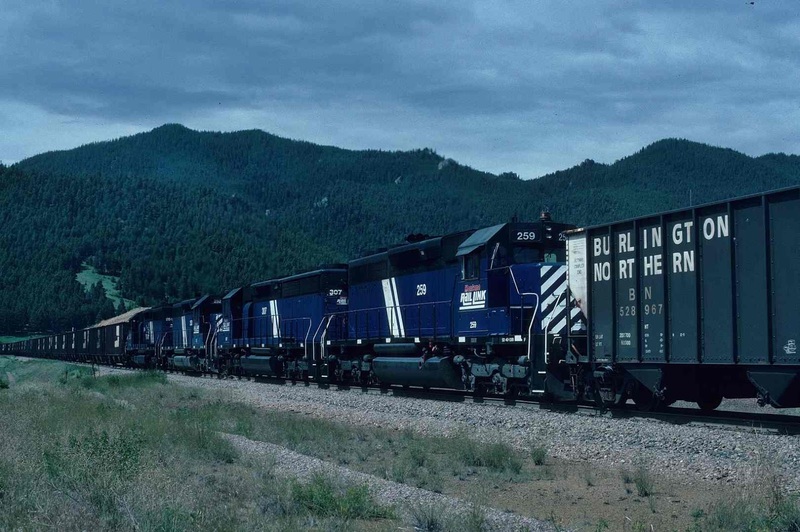 Here, near Trinchere, CO, on 6-7-02, Carl snapped a shot of an eastbound manifest struggling up the grade. 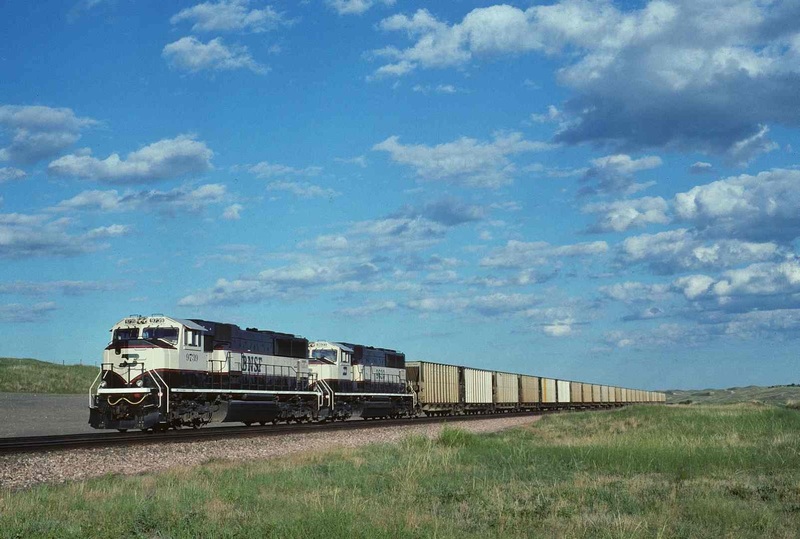 After this eastbound coal load for La Cygne, KS, passed Breezy Point on Crawford Hill, NE, 8-9-02, a strong wind nearly blew Carl and Paul off their perch. They soon abandoned the spot. Paul Walters photo. 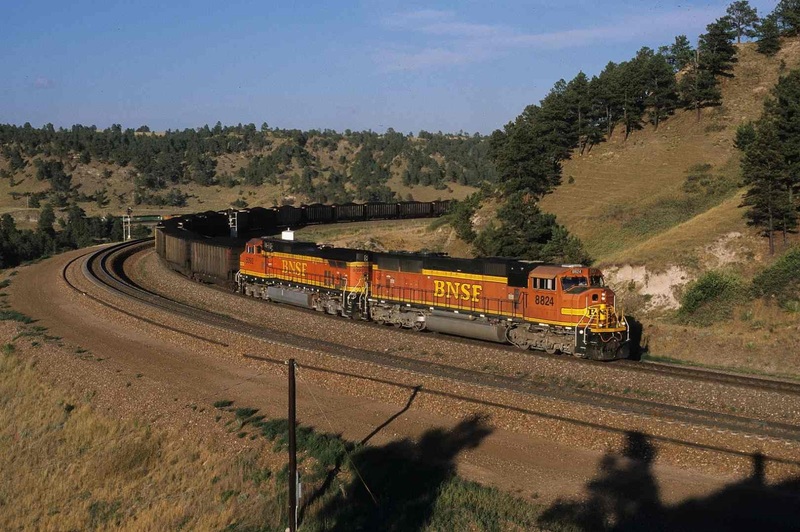 Bulls in the field at Big Ten Loop northwest of Denver, CO, caused Carl and Paul to abandon their planned hike to an even better location for more pictures of trains like this westbound SP coal train in June, 1993.